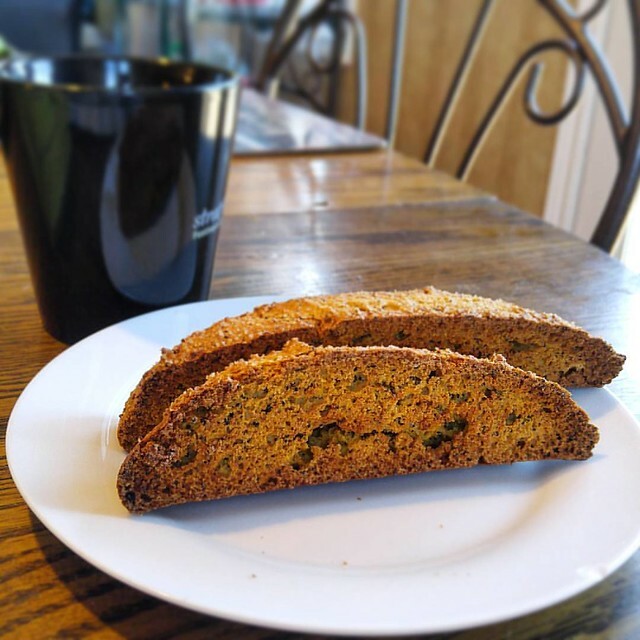 Lemon Poppyseed Biscotti - Two Ways (and an @InfinityJars review) | What Smells So Good? As a baker with an extensive, whole-foods based stock, I'm in a constant state of wondering if the seeds and grains I've purchased are still at their peak quality or if they're starting to go "off". My freezer is always packed to beyond bursting with various items, even more so now after we had a pantry moth issue that invaded almost everything. However, there is limited freezer space, and when it comes to times of year like the holidays it's at a premium. I was super-excited, therefore, to find an offer from a new-to-me line of storage solutions: Infinity Jars. They use a thick, deep purple glass to make their products, which helps to block the UV light that can cause things like spices and grains to break down and turn rancid, and they seal out the air as well. What I thought was cool was that this technology isn't actually brand-new at all, but is actually from the ancient Egyptian era. While they kept their sacred oils and herbs in theirs, I decided to preserve two of my sacred objects in the ones I received: poppy seeds and freshly-ground lentil flour. According to the company, you can keep the jars out on the countertop without worrying about degredation from light, heat and moisture, and so far, so good! My only sticking points are the relatively small sizes of container available (they go up to 1 L), and the price - granted, this is a premium item and well worth the cost, but I would stick to a few jars that I keep my most often used seeds or freshly milled flours (or coffee!) in. So, now that I could store my stuff at room temperature with zero quality compromise, what did I choose to do? Well, my decision was helped by the fact that my supply of poppy seeds didn't quite fit into the smaller container and I had just bought a large bag of lemons to make lemonade in my Home Ec class. Since I make quite good biscotti (if I say so myself), but still manage to fail at lemon poppyseed cake more often than not, my decision was settled. But why only make one batch if I could make two - one more-or-less standard, and the other a gluten free, vegan affair? The traditional version of lemon-poppyseed biscotti were made bright and light with lots of lemon zest, lemon extract and lemon juice. Just enough poppy seeds dotted the slices to bring a hint of nuttiness that helped set off the sweet and sour elements, as well as a visual appeal of course. Preheat oven to 350ºF degrees. Line a large baking sheet with parchment paper or a silicone baking mat. Whisk together the oil, milk, egg, egg white, extracts, 2 tsp lemon juice, sugar and lemon zest until combined. Add the flours, baking powder, salt and poppy seeds and gently mix until combined. Turn dough out onto lightly floured baking sheet and, with floured hands, pat dough into a rectangle about ½" thick. Brush entire surface with 1 tbsp lemon juice and sprinkle with sanding sugar. Bake for 20-22 minutes, or until the top and sides of the slab are lightly browned. Cut into 1" thick slices using a sharp knife. Set slices cut sides up on the baking sheet. Return to the oven to bake for 10 minutes. Flip, and bake the other side for 10 minutes. Remove from the oven and allow to cool for 3 minutes on the baking sheet (cookies will become crunchy as they cool). When I was scouting for Christmas cookie ideas a few months ago, I came across an idea for making these traditional cookies with besan - AKA chickpea flour. In addition to the poppyseeds, the delicate cookies get a hint of texture from rice grits and a tang from powdered citric acid. I used aquafaba to bind my biscotti, but flaxseed works too (as would a commercial egg replacer I bet). In a medium bowl, whisk together the flour, grits, baking powder, and salt. In a large bowl, whisk together the sugar, aquafaba, oil, and extracts until blended. Add the flour mixture and poppy seeds, stirring until blended (dough will be stiff). Divide the dough in half and place both halves on the prepared baking sheet. Using moistened hands, shape into two parallel rectangles, spaced about 3 inches apart. Bake for 45 minutes, until golden and the centers are set. Let cool on the pan on a wire rack for 15 minutes. Cut each rectangle crosswise into ½” slices. Place the slices flat, cut sides down, on the baking sheet. Bake for 20 minutes, until the edges are dark golden. So, either way you slice it, a finger or two of a bright, sunny biscotti is a light tasting accompaniment to a strong coffee!